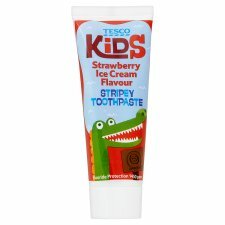 Kids strawberry ice cream flavour stripey toothpaste. Tesco stripey toothpaste has been specially formulated for children 3 years old and above to help keep their teeth strong and gums healthy. The toothpaste helps protect your child’s teeth from decay and is sugar free. The Strawberry ice cream flavour makes teeth cleaning fun and helps to encourage regular brushing.